Money. How much are you willing to spend on a container? I can go down the road to the convenient store and pick up a 32 oz or 1 L bottle for around $1. (It is very easy to find these bottles to replace them and better yet, they are easy on the wallet!) However, I can also go to a retail store or an internet store and spend around $15 – $20 on a fancy 32 oz drinking bottle. Of course I can also get on that same site (or the same store) and purchase a $30 (or more) 100 oz bladder. The point I am trying to get at is that there are quite a few different options to choose from, and they can start at dirt cheap! How much volume? How much do you need to carry? Typical volumes start around 24 oz and go up to around 100 oz, with many choices in between, and yes, even above and below. So, how much will you need to carry? Will you be on a lot of trails that follow right along side rivers, or will you be in the middle of the desert? Something to think about concerning water bladders (or actually any container) is that you can only fill the container to the top, but that doesn’t mean you have to fill it to the top. What I mean is you can carry 50 oz of water in a 100 oz bladder if you need to, but you can’t carry 100 oz in a 50 oz bladder, if you needed to… Understand? What will you put in it? Of course water, but will you be putting anything flavored inside the container? I like to mix Kool-Aid packs in some of my water so that I will have something other than just water with my meals. However, by doing so, the mixes may leave a taste in the container and I will have to work harder to wash it out. Also, if I use different flavors, they may not mix well. Just something to think about. How / where will you pack the container? Carrying a full 100 oz bladder can weigh as much as 7 lbs. It can also be rather large. This means you will want to have a place big enough to hold the bladder as well as some place close to the center of your back so that the balance will be right. Bottles can also take up quite a bit of room and these will not collapse any smaller. However, there are some water containers that will collapse. This can be ideal if you want to carry containers that you only need to fill at camp, or to have as a back-up container. Weight. I added this last because weight can be an issue, especially if you are counting ounces! Some water bottles and bladders can be as much as 7 oz or even more, whereas some of the 32 oz bottles are less than 2 oz (and surprisingly enough, the lighter ones are most usually the cheapest ones). It just depends on how much weight you want to carry overall. I do most of my hiking in the South East so we typically have a pretty good bit of water on or near the trails. Of course this is not always true so I must be prepared to carry more if I need to. So, I will go over what I typically carry with me and a little info about each. I bought the Camelbak Better Bottle and before I even carried it on a trip with me realized the heavy weight of it and decided against carrying it. 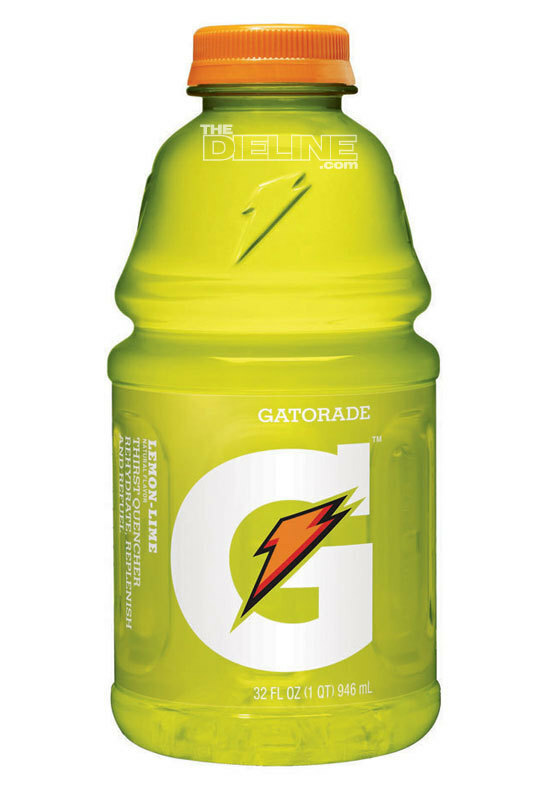 Instead I got turned on to using bottles from the convenient store, such as the Gatorade bottle and the Powerade bottle. I like carrying these bottles because they are cheap and when I buy them they are already filled! I use these bottles to mix my drinks in on the trail, and when I get home I just throw them away. It’s a beautiful thing. Also, the Gatorade bottle only weighs 1.6 oz and features a large mouth. My only complaint about these bottles is that they do not compress any smaller. If I want to carry them empty, they still take up the same amount of room as they do if they were filled. 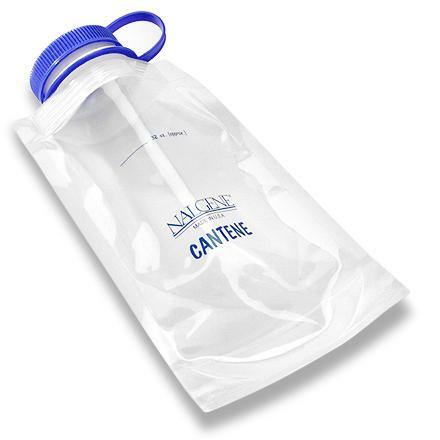 I recently purchased this 32 oz wide mouth Nalgene cantene simply because it will collapse, and only weighs about 0.4 oz heavier than a Gatorade bottle. My thought behind this is that I wanted something that packed smaller than the Gatorade bottles, but still held the same amount. This cantene was the answer. It’s listed volume is 32 oz, however it will hold closer to 40 oz when filled completely. However, this cantene will collapse and fit in corners of my pack that a Gatorade bottle wouldn’t dream of going in. 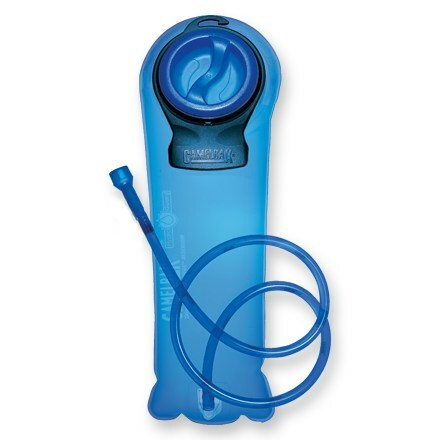 Using this, I fill my bladder with my drinking water for the day, and then when I get to camp I use this to collect my cooking water rather than carrying my cooking water all day. Since I boil my water I don’t even have to clean it, but if I choose to do so the wide mouth makes it very easy. My only concern with this cantene is leaking. Mine does not leak at the moment but I have read some reviews of other people’s leaking. This is my favorite new water container. 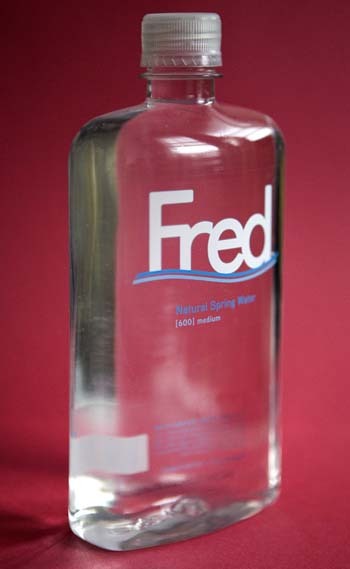 I came across a bottle of water called “Fred” the other day while in a supermarket. I did not particularly care about which brand of bottled water I drink, it all taste good to me. What caught my eye with this bottle is its shape. It is quite interesting. This bottle is shaped exactly like a flask. It is a typical plastic bottle with a typical plastic screw on lid. The bottle I bought will hold 13.5 oz and because of its shape and size, it feels quite durable. So, I picked one up. This bottle is small enough and designed right to fit in small places inside my pack (as any flask would), so I will probably carry it with me on a trip just to try it out. My only concern is that the small volume may make it not very worthwhile, however, there are other size bottles to choose from. 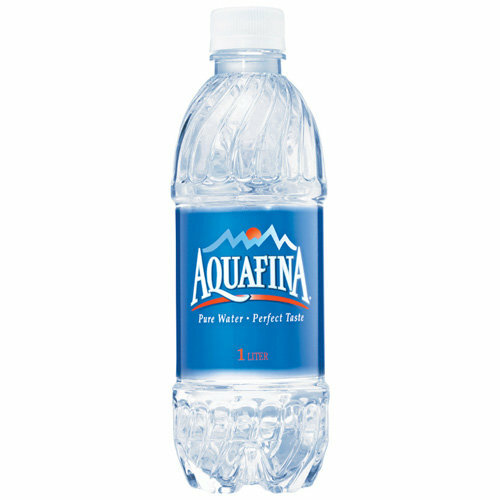 A lot of people prefer to use the 1 liter Aqua Fina bottle simply because it is light-weight, and very durable (possibly more so than the Gatorade bottles). These bottles also have a fairly large mouth, which makes pumping or cleaning water easier. These Aqua Fina bottles are designed a little different from the Gatorade bottles too in that they are taller and slimmer rather than short and fat. This could be a concern for use with a backpack with small side pockets. Ray Estrella has done a nice review of the Aqua Fina water bottle for use while backpacking and can be read here. So, anyway these are a few of the items I use and my thoughts on them. If anyone has anything to add, please leave a comment below, and thanks for reading. This entry was posted in Gear, Water Stuff and tagged Aqua Fina Bottles, Backpacking, Camelbak, Fred water bottle, Gatorade bottles, Hiking, Nalgene, nalgene Cnatene, powerade bottles, water bladder, water bottle, Water Container. Bookmark the permalink. Just curious does the Sawyer mini fit on the Fred bottles? The flat 33 oz bottle seems to be a good fit if it does. I am not 100% sure… I had a Fred bottle at one point, but not sure where it is now… or if I even still have it. One thing that you could try is to take a top from a 20 oz Sprite bottle, and see if it threads on the Fred bottle correctly. If so, then the Sawyer should work on the Fred bottle.